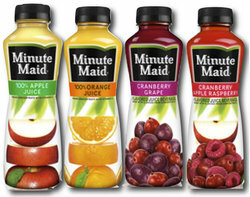 Minute Maid Juice (15.2 oz Bottles). Your favorite juices are now available in a larger bottle. 4 great flavors to choose from: Apple Juice, Orange Juice, Cranberry Apple Raspberry Juice and Cranberry Grape Juice. Mix and match all flavors for a variety or order 24 for a full case. 4 Great Flavors: Apple Juice, Orange Juice, Cranberry Apple Raspberry Juice and Cranberry Grape Juice. Mix and match for a variety or order 24 of one flavor for a full case.